You have to have the right tools. I had a decent set of tools when I started my project. I thought I did, anyway. 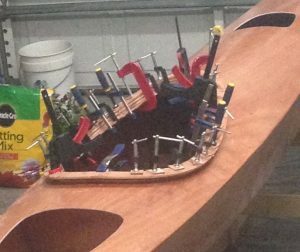 By the time I was finished, I had acquired two specialty saws, dozens of clamps, 6 different kinds of sandpaper, a disc sander, a set of wood rasp tools, and a host of other gidgets and gadgets I didn’t think I would ever need or own. Branding is the same. You can launch a campaign thinking you have all you need when you realize you’re short on tools, and short on skills. And that’s the next lesson. Tools without skills = no tools. A small sample of my new clamp collection. Before I could start sanding or varnishing or working with epoxy, I had to spend a lot of time learning how. I know it took me at least twice as long to build my boat because of that. Fortunately, I wasn’t on a timetable. Brands, on the other hand, do have timetables. Time is money. So, if you don’t have the skills AND the tools you need to build your brand, get help. Or get ready for a Viking funeral. A boat is built in stages. So is a brand. You have to build it before you launch it.